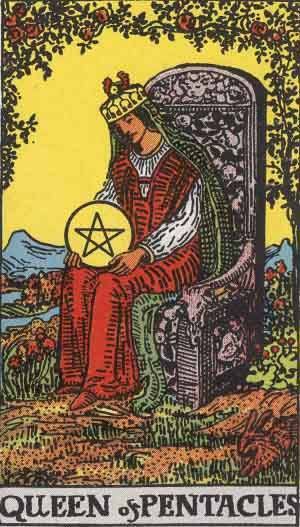 The Queen of Pentacles is the 13th card in the suit of Pentacles. Usually, the queen will represent somebody in your life, an older woman, who has a very comfortable life. Without even reading the meanings, you might already have an idea of who it may be. Many draw parallels between The Queen of Pentacles and the concept of Mother Earth; a nurturing feminine spirit that takes care of us if we take care of her. The Queen of Pentacles represents practicality, femininity, and work concerning your home life. Past – The Queen of Pentacles in the Past position can represent a warm loving upbringing and consistent support throughout your childhood. You probably had a very stable and loving family, probably more so than others you’ve known. The Queen of Pentacles can also mean that you’ve learned all the lessons in your childhood to grow into a well rounded and solid individual. You don’t want to make the mistakes your parents made and you want to grow to be a good foundations for others. Present – The Queen of Pentacles in the present position has a few meanings. You might just be settling down, and the Queen of Pentacles can reassure you that you’re going to have the time, energy and money to live how you want to; comfortably and free of stress. It can also represent a feminine influence in your life, usually somebody you can go to for advice. You might need them soon, and they will be more than happy to help. Future – The Queen of Pentacles in the future can mean a comfortable life in the future. You’ll achieve everything you want and spend your time enjoying yourself on smaller pursuits and with helping others. if you continue on your current path, you’ll likely be in a place mentally where you feel a lot of satisfaction and gratification by helping others. You aren’t going to worry about your current problems, in fact they’re going to seem minuscule in the grand scheme of things. Expect others to look up to you, whether this is because you have achieved something great in life, or simply because you have a generous personality and attractive qualities. Romance – The Queen of Pentacles in romance is a very good sign, the strong feminine energy can represent someone (either you, your partner, or someone you’re after) that enjoys spending time at home, helping others, maybe fixing things and other practical pursuits. This person will be a solid foundation for the relationship. This person does not like drama, and is calm and delicate in all areas of life. Friends – The Queen of Pentacles in regards to friendship means things are going well. To state the obvious, you might make a new, female friend. If you don’t want to take things literally, you might need somebody soon with practical home-based skills that you’re going to become friends with. Do you already know somebody like this? It could be a rewarding friendship that you’re currently missing out on. Money – The Queen of Pentacles in regards to finances is another good sign. Are you looking for work or have things taken a bad turn? The Queen of Pentacles is a good sign; you should be focusing your money and energy into your home life. Children, if you have any, depend on you. It might be worth taking a course in cooking, or even DIY if you haven’t already. Don’t keep your money bottled up and saved away if you have enough., Use it to enhance yourself and your living conditions. Health – The Queen of Pentacles is a mixed sign in regards to health. One interpretation can represent a nurse, or carer. if you are this person, or if you’re always helping others, make sure to take time for yourself too. Don’t overexert yourself, you’ll need people to help you too. Spirituality and Mentality – The Queen of Pentacles in spirituality means that now might be a good time to help and inspire others. Do you have any skills you can teach, especially home based ones? Why not give it a try? Talking with and exchanging ideas is a good thing to do now. Be open to everything. It can also be a time to help others by being open to give advice when it is asked for. Be the agony aunt for others, because it’s very likely you have been through the issues they are experiencing now. The Queen of Pentacles can represent disharmony when drawn in reverse. It can represent a person, probably an older woman, but instead of being a caring and nurturing individual when drawn upright, can signify a disruptive, negative influence on your life. The reversed Queen of Pentacles can show your own personality in some regards. You may have started open, affectionate and caring, but have changed over time to become more a bit more cold and uncaring. You need to think about why this might be, an if you feel this isn’t the case, you need to consider why some people may think about you this way. If you’re struggling in a certain aspect of life, then it might be because it’s just not for you. Different people are built for different things. Be sure to follow what you want to do, what feels natural, and what works with your inner code of ethics. We’ve selected live tarot readers to give you a FREE 3 Minute interpretation of The Queen of Pentacles! Scroll through them below and pick your favorite one.